Partners and family members of a person with bipolar disorder face many of the same challenges. They often have intense loyalty towards the person they love, but at the same time there may be anger, frustration and fear. For partners, the main concerns are usually whether the relationship can survive the illness and how bipolar disorder will affect children. For family members, the main concerns are usually the safety of their loved one and worry over how the illness is affecting the family dynamics. If one of these describes you, or if you simply aren’t sure how the illness may affect your life, please know there is hope. This page addresses some of the issues you may find yourself in today and suggests ways you can help your loved one get better. There is a link at the end of the article that will lead you to more information on my family and partner coaching. Communicating during a mood swing is the number one relationship problem when a person you love has bipolar disorder. Up to 50% of people with bipolar disorder refuse help or refuse to accept the diagnosis (yet you still have to live with the symptoms). Loved ones with bipolar disorder may be enthusiastic one day and withdrawn the next for no obvious reasons. 50% of people with bipolar disorder have trouble with alcohol and/or drugs. Often this is an effort at self-medication. Bipolar medication side effects can be very detrimental to a romantic relationship due to sexual mood changes and body changes. This list may seem frightening, but it’s important to know that relationships can definitely be repaired, even after dangerous and life changing mood swings. Solid and loving relationships based on open communication are possible. And even if you love someone who can’t get well or isn’t getting well, you can learn how to help yourself first and then work with them to improve your relationship. In my work as a family and partner coach, I see miracles every day. When my partner went into a three month manic/psychotic episode in 1994 and then into a suicidal depression, I truly didn’t know if he would ever get better. Would bipolar disorder change his brain so that he couldn’t work? Would I have to be his caretaker from now on? Where would we find the money to pay for his care? Would he always need medications? Would he live? I remember being scared every day. The reality was that he did get better. He was able to work again. And our relationship survived. The most often asked question I get from family members is, “How can I help my loved one accept that they have bipolar disorder?” Before answering this question, let’s look at some of the reasons many people with bipolar disorder may be in denial of the illness. One reason is that it can often be too painful for someone to face the future. Imagine what it’s like to have a lifelong illness that affects the way you think and feel, and that requires daily management and major lifestyle changes. For many people, the changes may feel too great. “Stop going out? I can’t do that! Quit my high pressure job? Are you joking? Stop drinking? Stop staying up late? Do you want me to be a monk?” Bipolar disorder often requires sweeping lifestyle changes in order to stay healthy, and it can be a lot easier simply to deny that there is a problem than accept this reality. Denial can also be a symptom of bipolar disorder itself. People who are in great crisis because of bipolar disorder and yet still refuse to admit they have an illness may appear to be stubborn and/or self destructive, but in reality it’s often the bipolar disorder that’s in control at this time—not the person. Even when you can clearly see that the illness is destroying their life, they may not be able to because the bipolar disorder won’t let them. Mania also plays a large role in denial. When someone suddenly stops their medication and denies they’re sick, this often indicates a manic episode and needs to be taken seriously. Mania often feels very good and can make a person forget the times when they were severely sick. Your loved one may believe they no longer have bipolar disorder, or that they never had it at all but were just depressed. Mania can actually change a person’s thinking from reasonable to extremely unreasonable and dangerous in just a few short days. It’s therefore important for everyone involved to recognize the signs of a manic episode before it goes too far. If you know for sure that your loved one has stopped taking their medication due to mania and they refuse to discuss it with you, it is time seek advice from a health care professional. This is especially true if the person is also showing signs of psychosis. A dual diagnosis can also contribute to a person’s denying they have bipolar disorder. “Dual diagnosis” means a person has a diagnosis of drug and/or alcohol addiction as well as bipolar disorder. Drug and alcohol abuse are the number one reason for “non treatment compliance” and “poor treatment outcome.” What this means is that if the person you care about drinks or uses drugs (pot included), they may deny the diagnosis even more, because they would have to not only accept that they have bipolar disorder, but also stop their drug or alcohol use. These are just a few of the reasons a person may deny a diagnosis of bipolar disorder. There are many others, and it can be extremely frustrating for partners and family members when their loved one refuses to get help. I work with many family members and partners in this situation and I always ask them, “If your loved one won’t get help right now, what are you going to do?” I don’t mean what are you going to do about them, but rather what are you going to do to help yourself? There are many options. The first step is to create a management plan that you and the people around you can use when you have to interact with your loved one. There are ways to communicate with your loved one even when they are in a severe mood swing. You can learn to stop fights, deflect accusations, deal with destructive behaviors and be there for the person you love whenever possible—all without losing yourself. There are also many people with bipolar disorder who do accept the diagnosis and are open to treatment but are simply not getting better. They may have tried many medications, but their mood swings are still raging. In this situation they may turn to their partners or family members in desperation for help. Often the only thing family members know how to do is seek further medical advice and hope that love and support will be enough to make things better. Unfortunately, this is usually not enough. When a person isn’t responding well to traditional treatment, a comprehensive management program is an absolute necessity, one that addresses specific behaviors and symptoms. If you are in any of the situations mentioned above, you probably do not know what to do. It is not innate to know how to help someone manage bipolar disorder. 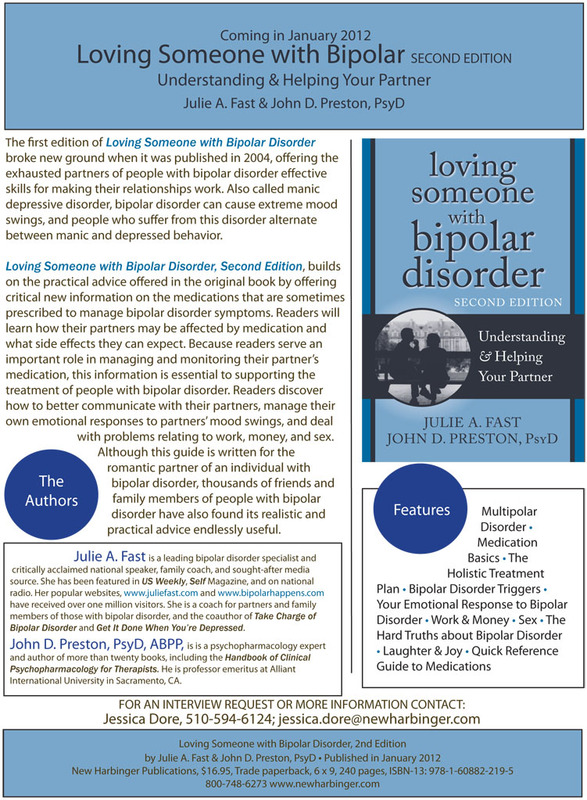 Most treatment books on bipolar disorder are only for those with the illness, or else they are fact-based books explaining bipolar disorder on a technical level. While these books can be helpful, what family members and partners need most—especially once the illness is in full swing or if the person they love has tried everything and can’t get better—is a practical, hands-on management plan to deal with all the various situations that arise. I coach partners and family members of those with bipolar disorder. My goal is to help you get a loved one into treatment and then started with a management plan. My success rate is high. I understand what you are going through. Here is a link to learn more about my coaching: Family and Partner Coaching. It can be hard to love someone with bipolar disorder. What you may have learned in the past about maintaining stable and loving relationships simply doesn’t apply when faced with this illness. You must therefore learn everything you can, including the various bipolar medications and how they work, the full spectrum of symptoms, triggers and behaviors specific to the person you love, etc. You must also learn effective ways to communicate with your loved one around the illness, especially when they are in a mood swing. And you will need to create a plan for yourself that you can use with your loved both during and between mood swings.